There are those who suppose, based on his high-speed history and fast-talking demeanour, that BLURR lacks patience. Those people are wrong. He appears to be always on the move because he always has somewhere he needs to be - delivering a sensitive data packet, or a round of electro-laser fire to a DECEPTICON squad. When he must wait, he can do so in absolute silence and stillness for hours, until his target is centered in his cross-hairs. For many of us, our first glimpse of Blurr was in the 1986 movie in which he was introduced as a fast-talking, fast-moving, and ever so slightly insecure Autobot. He rapidly became one of my favourite characters out of the new batch along with Kup and Springer. As with many G1 incarnations I felt that the original figure was a let down in terms of articulation and aesthetics and as such I have been waiting for a long time for a definitive incarnation of the character. The closest to one so far has been from the Animated line which was a great figure but due to the cartoon-like style didn’t quite pull it off. Generations Blurr still doesn’t quite cut it but is still a damned good effort. 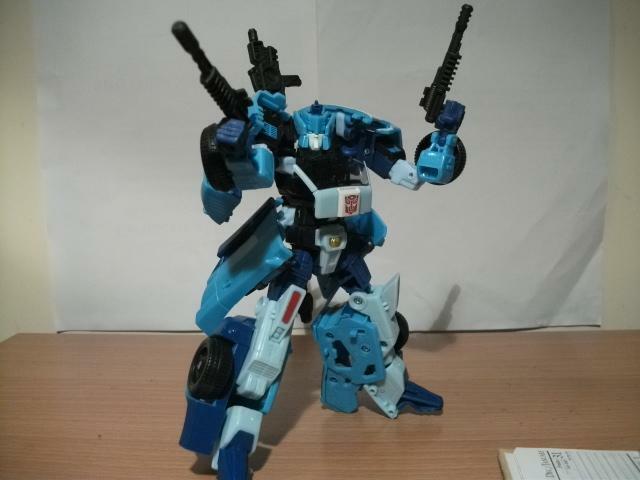 Blurr is basically a repaint of Generations Drift with different weapons and a different head sculpt. When I first heard this I was disappointed to say the least, a classic character and fan favourite is now just a repaint of an unpopular new character? How dare they!? Even so, I went ahead and purchased him and was pleasantly surprised. The first thing you notice about Blurr is his visually striking paint-job, a few different shades of blue with the odd bit of white thrown in. The colours are distributed well enough so that he isn't overwhelmingly blue and consequently doesn't end up looking like a robotic smurf. His head is superbly designed and closely resembles his IDW incarnation, it looks aerodynamic and even has that weird vent appendage on the top that we see in the G1 original. Blurr has the same bulky shoulders and chunky feet as Drift which is unfortunate as it detracts from the characters speedy image. Seriously, I've tried to put the guy in a sprinting pose but he just can't pull it off. Luckily all is not lost thanks in large part to his accessories. Whereas Drift came with 2 small swords and one massive one, Blurr comes with dual-pistols and a great big sniper rifle that clips on to his back. The dual-pistols make for some great poses and having his car doors act as holsters is a nice touch. You can also attach the pistols to the front of the sniper rifle to make a stand for the barrel or a nifty looking three barreled weapon. The biggest let down here is that due his great big clunky shoulders you can't really position him in any more than about 3 poses with the rifle. For example, I attempted to position him so that it would look like he was looking through the scope and taking aim but his arms just wouldn't allow me, all you can really do is have him holding it at waist height. Despite the shortcomings inherited from the Drift mould Blurr's robot mode still looks great. The designers have evidently done the best they can to make the figure look as individual and as loyal to his G1 incarnation as possible given that they have had to use another character as a base. After a relatively easy transformation Blurr becomes a modern, albeit outrageously blue, sports car. Whereas the recent Classics/Universe/Generations lines have updated and modernized the majority of G1 alt-modes, Blurr seems to have taken a step back. As we all know he was previously a futuristic sports car but now, thanks to the Drift mould, he is just a bog standard street-style sports car. 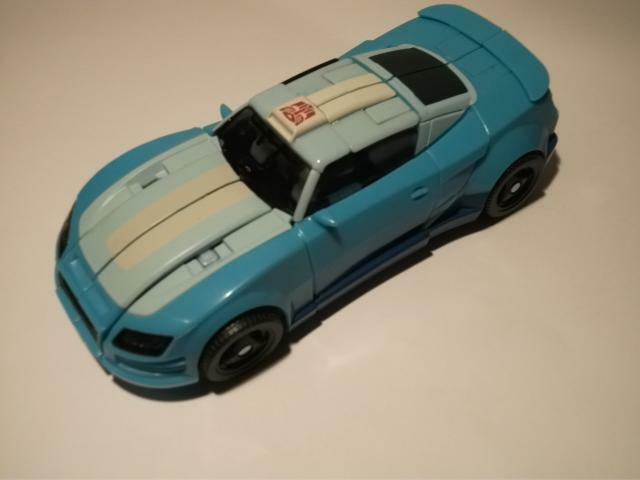 Blurr's paint job really does work well in this mode with the white forming a racing stripe through the top of the light blue roof and bonnet, the shall we say "Blurr Blue", takes up the majority of the vehicle and a small stripe of the darker blue on the bottom of each side. Unlike Drifts plain white and random Japanese bits, Blurr's paint job goes a long way to complimenting his sleek, streamlined curves and sporty image. Blurr also has a smaller spoiler than Drift which really adds to the sleek design. The feature that I really like about these new figures is that you have somewhere to store the weapons. His dual-pistols slot neatly into the car doors and his sniper rifle clips on underneath with the barrel forming an exhaust pipe at the rear. His alt-mode may not be what I had in mind for Blurr but I like to think that had he arrived on modern day Earth, this is close the alt-mode he would have chosen. Transformation: 9/10 Nice and relatively straightforward without any really awkward bits, although you do have to position the feet exactly right when switching from robot to car. Articulation: 7/10 would be an 8 or 9 if those big shoulders didn't get in the way of some cool poses and if the massive feet were a bit more dynamic. Durability: 9/10 A solid well built figure, so far I’ve only had one occasion where his arm has popped off the ball joint during transformation, all joints are nice and stiff. Fun: 8/10 I really do enjoy playing with this guy, largely due to his accessories, the only let down is that he's a repaint, an alt-mode based on that of his current IDW incarnation would have been nice. Price: 10/10 I picked him up in TRU whilst on holiday in New York for $12.99 which worked out at about �8, bargain! Overall: 9/10 In my opinion this is the best attempt so far at a decent Blurr figure, although he isn’t an original mould and as such suffers from Drift's shortcomings, he's still a great figure and is definitely worth picking up if you've ever had any affection for the character.